Shopping trolley? Mum’s taxi? 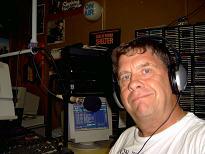 Pop’s get about? Absolutely! What’s more it is very good at it. 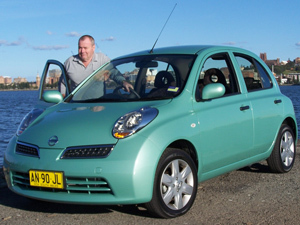 The Next Car Team take out Nissan's Micra City for a week to utilise it for the purpose we described above. The City is a package deal, only available with automatic transmission, as you would want in the city environment. City is of the hatch design requiring very little in the way of parking space (overall length 3,725 mm) and certainly aptly named. Easy on the eye and pleasurable to manoeuvre around the metro CBD where it feels most at home. Although not unduly stressed on the open road or freeways either, but at its very best in town. 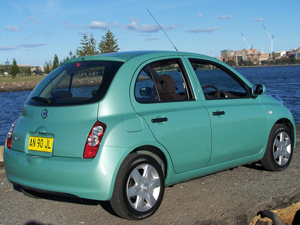 Available in only 2 specifications, Micra and Micra City, there is a price difference to the consumer of $3,000 (approx). The mechanicals and trim fabrics are the same for both variants of Micra. With City there are 4 x 15” alloy rims running 175/60R15 tyres, a 6 disc in-dash CD player/radio with MP3 capability and 6 SRS airbags which in turn gives a 5 star ANCAP rating. Both models have a full size steel spare. A cute looking little package, the external finish and panel fitment are very good, although I was a little perplexed at the lack of duco under the bonnet. Maybe I should rephrase that, there is duco under the bonnet, but a different colour to the exterior. Yes, the under bonnet and the top of the suspension struts were painted a matt grey. A further check of other cars revealed the same pattern exists. Not that this change of paint colour detracts from the car, it does not. It’s unusual, that’s all. There are 11 choices for external colours, 9 of which are metallic finish and attract an extra cost. Powered by a 1.4 litre, double overhead cam, 16 valve, 4 cylinder petrol engine producing 72 kW at 5,600 rpm and 137 Nm of torque at 3,200 rpm sent to the front driving wheels via a 4 speed (read 3 speed plus overdrive) automatic transmission. This package, weighing in at 965 kg is very responsive to a light touch on the accelerator and the fuel consumption quoted by Nissan is just 6.8 1/100 km for the combined cycle. Interior comfort has not been forgotten in the Micra City with the driver gaining some extras above the other passengers. An armrest on the left side of the drivers’ seat, auto up/down function on his/her window as part of the power window system, power assisted rack and pinion steering with the wheel being adjustable for rake angle. There are 5 seating positions; all have retracting and self locking lap/sash safety belts. Mounting points are provided for 3 child safety capsules/seats; however with an interior width of a little over 1,400 mm there appears little hope of fitting any more than 2 capsules. But hey, not everyone has triplets. Cup holders, passenger assist grab handles are provided front and rear. The rear seat backrest has a 60/40 split allowing for long or bulky loads to be placed in the boot, which also has a very reasonable load height. Air conditioning is supplied as standard equipment whilst being ably aided by UV reducing side and rear safety glass. Throughout the cabin area there are numerous storage portals such as a drawer in the glove box and another under the front passenger seat, very handy for concealing things from prying eyes. Remote keyless entry and an immobiliser are also featured. Remembering that this is a small car, the ride quality (depending on road surface) can be a little harsh but the suspension works well. At the front there are Macpherson struts with coil springs and stabiliser bar while the rear end is kept in place with an H-shaped torsion beam and a stabiliser bar. Disc brakes are fitted up front with drums at the back. Fitted technologies include ABS, EBD and BA. We drove this gem around the urban area of Newcastle and on the freeway from/to Sydney. Overall it achieved what we believe to be the manufacturers’ aims of producing a city friendly 'get about'. It is a well built, well finished product and our test car, the Micra City, has a five star ANCAP rating.